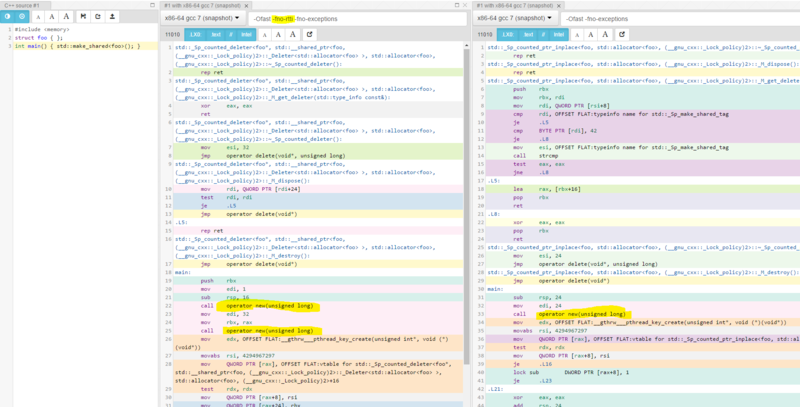 Contains a single call to operator new if -fno-rtti is not passed. Contains two separate calls to operator new if -fno-rtti is passed. Why is this happening? Why does disabling RTTI prevent make_shared from unifying the object and control block allocations? No good reason. This looks like a QoI issue in libstdc++. Using clang 4.0, libc++ does not have this issue., while libstdc++ does. and in general, get_deleter isn't possible to implement without RTTI. It appears that it is using the deleters position and the tag to store the T in this implementation. Basically, the RTTI version used get_deleter. get_deleter relied on RTTI. Getting make_shared to work without RTTI required rewriting it, and they took an easy route that caused it to do two allocations. make_shared unifies the T and reference counting blocks. I suppose with both variable sized deleters and variable sized T things get nasty, so they reused the deleter's variable sized block to store the T.
A modified (internal) get_deleter that did not do RTTI and returned a void* might be enough to do what they need from this deleter; but possibly not.